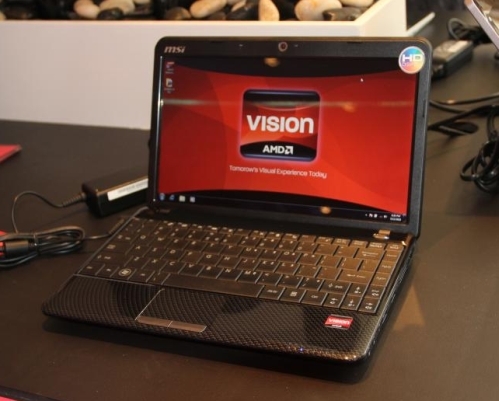 In addition to the Vision event at the Cannes Film Festival, AMD apparently had a couple of notebooks on display there as well and apparently MSI's 12-inch Wind U250 was also up and running. The U250 was rumoured a while back and this 12.1-incher happily runs on AMD's Athlon II Neo K325 CPU clocked at 1.3GHz. Some of the specifications should include a DirectX 10.1 capable integrated graphics and Windows 7 OS. Unfortunately, besides a bunch of pictures, Newgadgets.de was pretty scarce on the rest of the specifications. Hopefully bunch of other detailed specifications should show up eventually. You can check out the the rest of the pictures here.